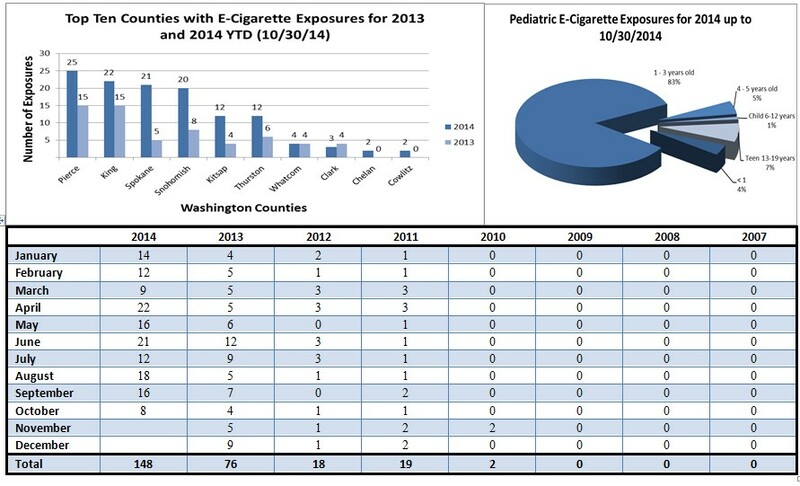 The number of poison calls on liquid nicotine products has increased substantially at the Washington Poison Center since the first two cases in 2010. “The current trend in liquid nicotine exposures is extremely concerning, and it’s only a matter of time before a child or adult has a serious, if not fatal, outcome”, says Dr. Alexander Garrard, Clinical Managing Director at the WAPC. Pierce, King, Spokane, and Snohomish counties alone account for almost 60% of total cases called into the poison center. Children 1- 3 years of age continue to account for >80% of pediatric exposures to liquid nicotine products. *Disclaimer: Reporting of exposures to the poison center is voluntary and not mandated by law. As such, WAPC data describes the number of calls called into the poison center and most likely is an underrepresentation of the true occurence of any one substance. All calls to the Washington Poison Center are free and confidential.